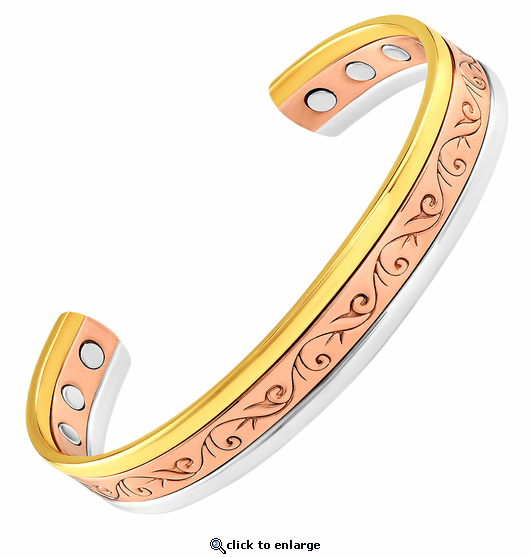 This is a wonderfully designed solid copper therapy magnetic bracelet. It is made with three solid metals all made from pure copper with no color plating. Styled with grape vines from the vineyard, this therapy bracelet has 6 powerful 3000 gauss rare earth bio north facing magnets and stainless steel magnet caps for added durability. It is also made nickel free. This is truly a special design and suitable for any occasion. very nice product my wife loves it I told her it will cure all her problems so I will get back after some time passes and let you know if it works. I've had my bracelet for about 2 weeks and I definitely feel better, fewer aches and pains all over my body. I'm very satisfied. I am happy with the bracelet. It's attractive and has helped my pain from a broken arm and bone chip. This bracelet is more than expected. A beautiful piece of jewelry, well made and polished. Makes me look classy. Love this bracelet, plus my wrist no longer aches. Everyone comments on how pretty it is!